As hard-hitting as its title, Brute Force was the first of Jules Dassin's forays into the crime genre, a prison melodrama that takes a critical look at American society as well. Burt Lancaster is the timeworn Joe Collins, who, along with his fellow inmates, lives under the heavy thumb of the sadistic, power-tripping guard Captain Munsey (a riveting Hume Cronyn). Only Collins' dreams of escape keep him going, but how can he possibly bust out of Munsey's chains? Matter-of-fact and ferocious, Brute Force builds to an explosive climax that shows that man's desperation for freedom knows no bounds. 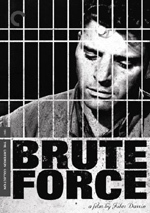 One of the filmmakers to be openly blacklisted by the anti-Communist hoopla of the 1940s and 1950s, director Jules Dassin brought us 1947�s crime drama Brute Force. The flick introduces us to some of the inhabitants of overcrowded Westgate Penitentiary. Joe Collins (Burt Lancaster) returns to his cell after 10 days in solitary. He ended up there after sadistic jailer Captain Munsey (Hume Cronyn) forced Wilson (James O�Rear) to plant a weapon on him. As one might expect, this doesn�t sit well with him, and he moves to get revenge. Pressures affect the staff at Westgate as well. Warden Barnes (Roman Bohnen) receives instructions to rule the prison in a harsher manner in the interests of �discipline�. More liberal Dr. Walters (Art Smith) vocally protests this push away from rehabilitation, but Barnes cows under the threats. In the midst of this, Joe learns that his girlfriend Ruth (Ann Blyth) needs an operation but won�t get it without him by her side. This encourages him to attempt to break out of the prison. The movie follows his pursuit along with other issues at Westgate. 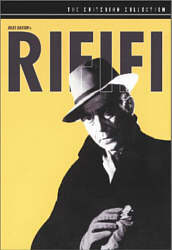 I must admit I knew little about Dassin before I saw 1955�s Rififi. I liked that flick quite a lot, and Force offers me more encouragement to check out more of Dassin�s work. As with Rififi, Dassin displays a fine sense of visual drama in Force. The movie�s standout moment comes when the prisoners get revenge on Wilson for squealing. This dramatic, wordless scene uses the clamor of the clanging tools to stir up the tension. It veers on the edge of being too showy, but it works, as it creates a very tense, memorable sequence. The movie also neatly balances the emotions of the participants with the harsh realities of their lives. Usually when we see prisoners moon about what they miss on the outside, we get stuck with goopy romance. A little of that comes from Force, but we also find some more cynical memories, such as when we learn about Spencer�s brief time with Flossie. Even Tom�s love for wife Cora gets a bit of an edge to it. Those tendencies lend Force a nice sense of drama without the expected melodrama. We feel for the prisoners but don�t get sappy, schmaltzy versions of their lives. The movie seems hard-bitten and cynical, but not relentlessly so, or in a forced, phony manner. Instead, it gives us a somewhat sanitized � due to censorship issues of the era � but usually believable view of prison life. Some fine performances help, especially when we look at Hume Cronyn�s turn as Munsey. He offers a counterintuitive take on the role, as instead of the usual blustering bully, he makes Munsey exceedingly low-key and understated. He�s just as sadistic as we�d expect, but in a gentle, quiet way. Add to that a not-too-subtle fascist overtone to the character and Cronyn�s performance works awfully well. I wouldn�t call Force a revelatory prison drama, as it follows the usual threads. It�s tight and involving nonetheless. It brings out a vivid picture of its characters and situations to turn into a tight, memorable piece of work. Brute Force appears in an aspect ratio of 1.33:1 on this single-sided, double-layered DVD; due to those dimensions, the image has not been enhanced for 16X9 televisions. Though not exceptional, the transfer seemed pretty positive. Sharpness usually worked well. A smidgen of softness crept into a few shots, but not with any frequency or severity. The majority of the flick demonstrated nice delineation and definition. Neither jagged edges nor shimmering appeared, and edge enhancement seemed mininal. Given the flick�s age, I expected some source flaws, but not too many materialized. Grain could be a little heavy, and I also noticed a few specks and marks along with one brief streak. These weren�t a significant issue, though, especially for a movie on its 60th birthday. Blacks remained dark and dense, while shadows were smooth and clear. Overall, I found this to be a satisfying transfer. Similar thoughts greeted the monaural soundtrack of Brute Force. Speech seemed slightly metallic but remained crisp and intelligible, with no edginess or issues connected to intelligibility. Though music lacked great range, the score was more than acceptable as it displayed decent clarity. Effects were similarly clear and concise. No, they didn�t demonstrate much punch, but they sounded fairly accurate and lacked distortion. I noticed no problems with background noise or similar issues. This was a perfectly solid 60-year-old mix. When we head to the extras of Brute Force, we begin with an audio commentary from film historians James Ursini and Alain Silver. Both sit together for this running, screen-specific piece. They discuss cast and crew, themes and symbolism, characters and story, sets, cinematography and staging, blacklist issues, film noir topics, score, and a few other production elements. Silver and Ursini present a nice mix of facts and interpretation. Actually, I admit I�d rather hear a little more background for the participants and notes about the shoot, but that�s just my preference, and it shouldn�t indicate that I think the pair do poorly in that regard. Indeed, they cover both sides pretty well and bring out a lot of good info about the different subjects. This is a rich, informative, and worthwhile chat. Next we find a 15-minute and 52-second Interview with Criminologist Paul Mason. The editor of Captured by the Media: Prison Discourse in Popular Culture, Mason discusses Force�s place in the prison genre. He gives us notes about setting, themes, characters and situations. He also offers a quick overview of the genre�s evolution over the decades. Mason brings out a few good insights in this useful little program. In addition to the film�s theatrical trailer, we find a Stills Gallery. This collection includes 40 pieces. We see ads for the flick, shots from the movie, and behind the scenes photos. It�s a decent selection of images. Finally, the package includes a 42-page booklet. This piece presents a look at the film by film critic Michael Atkinson, a 1947 profile of producer Mark Hellinger from the Saturday Evening Post written by Pete Martin, and letters exchanged between Hellinger and Production Code boss Joseph Breen. As usual, Criterion gives us a fine booklet to flesh out the set. Taut and punchy, Brute Force provides an involving prison drama. It balances a mix of topics well and gives us an exciting and moving view of various topics, all done without excessive melodrama. The DVD features good picture, sound and extras. I recommend this intriguing movie and positive package.